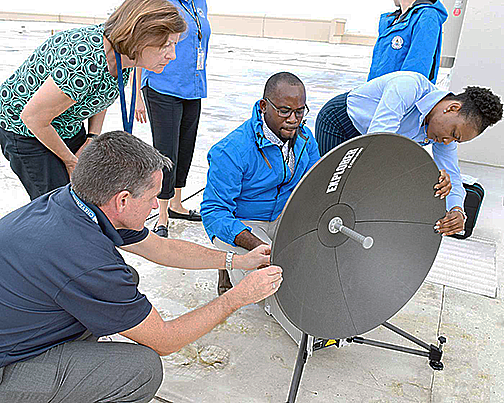 The Cayman SATCOM system being tested on the roof of the Government Administration Building in George Town on Thursday, September 6. If all phone and internet systems fail in the Cayman Islands, a new satellite communications system is now available for government and emergency response teams to contact the outside world, according to the Governor’s Office. Prompted by communications issues that arose following devastating storms in the Caribbean last year, the British government is equipping their overseas territories that face threats from disasters, such as hurricanes, with emergency satellite communications, said Matthew Forbes, head of the Governor’s Office in Cayman. The Cayman system was tested on the roof of the Government Administration Building in George Town on Thursday, September 6. Mr. Forbes and Danielle Coleman, director of Hazard Management Cayman Islands, were deployed to the British Virgin Islands following last year’s hurricanes, and witnessed firsthand the challenges faced in the aftermath, including lengthy telephone and internet outages and a complete loss of communications with outlying islands. The new communications equipment also includes a portable static satellite system which can be taken out into the middle of a field somewhere and create a WiFi bubble and phone system. The new communications system also includes handheld satellite telephones. Mr. Forbes said of the new equipment, which the U.K. Foreign and Commonwealth Office funded and supplied that this provides quite a step change in the communications reliability of the islands. He added that the testing of equipment and regular training for personnel is vital to ensure that key staff members are familiar with the operation of the communications system. He said the tests had been successful and the system was ready to be used immediately in the event of a disaster locally.